This guide aims to help players of all skill levels get the most out of their hero. Basically, doing everything you can in any given situation. It will discuss things such as proper skill usage to maximize damage dealt, optimal chasing tactics, survival tactics, and other various tactics. In every single game, you will encounter situations where you can utilize these techniques, and it is in every player’s best interest to make the most out of these situations. It makes logical sense to do everything you can to ensure that no marginal escapes or deaths happen. If these marginal cases do indeed happen after you’ve done everything you can, then you will not have any regrets afterwards. You will no longer have to bang your head on the desk after letting your target escape with 10hp, and you will no longer have to curse at your monitor every time you get killed in a poorly fought battle. A lot of these tactics are overlooked by a lot of players, and people who know these tactics may not use them because they may, or usually forget to. It’s a big mistake to dismiss these techniques as useless, as these little things can add up to make a big difference in the game, especially during early and mid game. There is a popular saying: “Information is Power”. Not only does this saying apply to situations IRL, it also applies to DotA. The more information you have, the better you will be able strategize and formulate your plans. There are two kinds of information: Explicit Information, and Implicit Information. Explicit Information refers anything that any player can know at any given time in the game. These include things like spell damages, mana costs, and cooldowns, game mechanics, and what items each player has. Implicit Information refers to things that one has to pay attention to in order to figure out. This includes things like a player’s play style, tendencies, actions, and their skill build. For example, if you see a Pudge move over to the side, you can deduce that he is going to aim a hook at you. If you see a Zeus with an extra +2 stats on all attributes at level 2, you can conclude that he is doing a bolt/stats build, and will not have arc by at least level 4. Sometimes, I like to try and guess my opponents item without highlighting their hero. Of course, it’s not really possible to guess items such as Bracers, point boosters, etc… but it is very possible to deduce whether they have Boots of Speed, Power Treads, or Boots of Travel. You can also tell if they have any magical resistance, and possibly which damage item they have (Sacred Relic, Crystalys, etc…). These small observations may come in handy in those fights where you are too preoccupied with controlling your hero to highlight your opponent’s hero. The more you know, the better off you will be. If you can tell me the approximate cooldown, mana cost, and damage of level 2 magic missile out of your head, then you probably have enough Explicit Information stored in your brain. If not, play more and pay attention to these subtle details. Implicit Information requires in-game observations, and you should constantly be searching for it in your lane. If you know exactly what you’re up against, you will know how far you will be able to push your hero to its limits at any given time. The shift button is a wonderful thing. By holding down shift, you can queue up commands for your hero to do one after another instantaneously. This applies to move commands, attack commands and spells. However, some spells have a long animation to it (i.e., CM’s frostbite), so it is better not to use shift for those spells. You are better of manually cancelling the spell with a move or attack command. Again, it is very useful to have the Explicit Knowledge regarding which spells have these “lag” properties. Now, why is this important? Here are a few situations where proper usage of waypoints will come in handy. You can hold shift, eat a tree, and issue a move command afterwards. You hero will look like it eats the tree while moving. Using this technique will ensure that the distance between you and your chase does not get any shorter. Your opponent will not be able to get a hit in on you (assuming equal or near equal move speeds), or get within casting range of their spell. It also allows you to move into the fog of war faster, so if his spell just finished cooling down, he will also not be able to cast it on you. So you’re chasing an enemy and you have one of the three items above. Hold down shift, cast the item on their hero, and issue a move command forward. Right when your hero gets within casting range of the item, cyclone/purge/hex will come out, and your hero will keep on moving forward, minimizing the distance between you and your enemy. This allows you to get in extra hits, thereby maximizing the damage dealt to your opponent. This also applies to situations where the enemy is chasing you. Hold down shift, move to a spot further up ahead so your hero keeps running, cast the item on their hero, and issue another move command in the direction that you’re running. Your hero will gain valuable distance on the opponent, and the extra time it buys you can make a difference in determining whether or not you die (especially against heroes like specter, bloodseeker, Spiritbreaker, etc…). In the case of Sand King, many people know how to shift-queue epicenter in conjunction with Kelen’s Dagger. However, if you do not have Kelen’s Dagger, then you have to rely on your burrowstrike/epicenter combo. After you burrowstrike in and start channeling epicenter, hold down the shift button and issue a move command in the direction where the opponent is going to run. This ensures that everyone who is initially in the range of epicenter, stays in the epicenter. Similarly with Pudge, hold shift down while dismembering, and issue a move command in the direction where the opponent is going to run. This maximizes the disabling time of dismember, as well as the damage. It also basically guarantees that your target will not escape the slow from your rot. For Rhasta, you can shift-queue your disables to maximize the duration of shackles. While channeling shackles, hold shift, press D, and click the hero. After shackles is over, your hero will automatically cast hex. This ensures that a blinker, for example, does not get away from you, or ensures that the target hero will not be able to cast any spells to disable, or damage you. In those cases where you come across a rune while you’re being chased, queuing up a move command after you bottle/grab the rune will enable you to keep a distance between you and your opponent. I’ve seen many cases where people have come across a haste rune, only to stop for a split second after they get it, and die from a storm bolt coming from Sven who got into cast range in that split second. A lot of people know that you can time a TP shift-deny a tower. However, what if there are 3 heroes banging away at the tower, and they start positioning themselves to stun you the instant you TP over? You may be able to deny the tower, but you will die in the process. Now… suppose you are playing Stealth Assassin. Instead of TP denying the tower, you can shift cast a Smoke Screen after you TP. Follow that up with another command to deny your tower, and another to move your hero out of harms way. Be creative, and add in extra commands (whether it be a cyclone, hex, echo slam, etc…) when required to. You should always always animation cancel spells and attacks during the early to middle game phases. At this point in the game, a single hit can mean the difference between a kill and an escape. As the game goes on, heroes do more damage, and this becomes less and less of an issue. When ganking somebody from behind, do not open with a stun unless the target hero has a spell that can screw up everything (i.e., windwalk, fissure, reverse polarity, etc…). You should always try to move close to the target, and get in couple of hits while your target is running away. Wait until they approach the cast range of your stun before casting it. As for nukes or spells with short cooldowns (blink strike, for example), use them ASAP and follow their hero. Better yet, if you can block the enemy’s path by moving into it (like creep blocking), do it. This will allow your allies to get in more hits as well. If you can, try to squeeze in couple of hits, but remember to stay within range of your spells so you can cast them again after they have cooled down. Don’t just right click the enemy, as you will lose precious distance. When ganking heroes with a built-in escape mechanism (Void, Clinkz, BH, etc…), you need to chain stun them. This is the process of casting stuns in succession, while trying to maximize the duration of each stun. Against heroes without an escape mechanism, use the tactic mentioned above. Try to get in as many hits in as possible in before initiating, in between spells, and while chasing. This will help conserve your mana so you can use it on other heroes later on. Remember to animation cancel! Also, pay attention to the space between heroes. 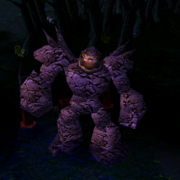 If 3 melee heroes decide to gank a centaur, and all 3 of them right click the centaur at once, the centaur will hit all 3 of the heroes with stomp, and run away unharmed. Try to space yourselves out so it is harder to hit multiple heroes with a single spell like impale, hoof stomp, or light strike array. If the enemy managed to get out of range of your spell, don’t worry! If your hero has any spell that can be cast in a line, or a spell that targets an area in front of it, then you still have a chance to catch up. Examples of spells that have this property are Shadowraze, Dragon Slave, Carrion Swarm, Meat Hook, and even Impale. 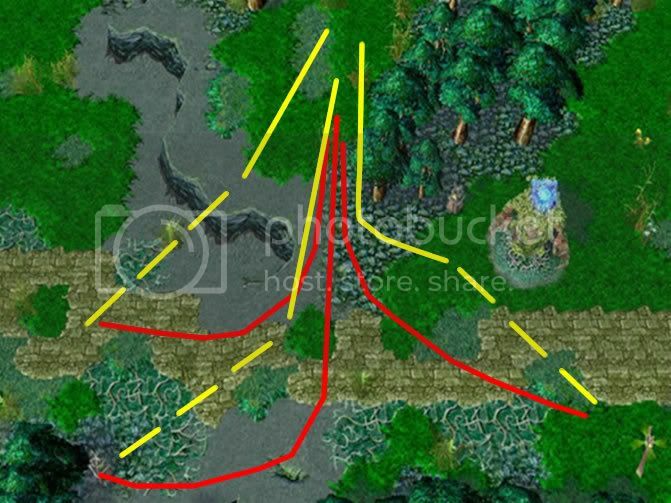 On the DotA map, there are a lot of corners to turn, and due to the shape of the corner, the distance between you and your target will decrease once they cut the corner. For example, take a look at this spot. The red line indicates possible paths that your opponent will take. The yellow line indicates the path you will take in response to the path the opponent will take. The dotted portion of the yellow line indicates how you would cast your line spell to hit them. As you can see, no matter where your opponent decides to run, the distance between your hero and his will decrease. Therefore, don’t give up when the hero runs out of your range. If you them approaching a corner that they’ll have to cut, keep on chasing and you may be rewarded. Many people break their invisibility with a spell, which is not the optimal choice to make. Using the concepts discussed 2 sections earlier, it would be best to move close to the hero, get some hits in, and then use your spells. Suppose you are playing Vengeful Spirit and you pick up an invisibility rune. Instead of stunning your target right out of invisibility, you walk right beside your target, hit them twice, and then use your stun when they begin to retreat. Coupled with animation cancelling, hitting, and running, you’ve earned yourself 2 free hits in the beginning! It may not seem like that big of a deal, but if you decide not to do it and your target ends up getting away 1 hit from death, you can go on ahead and shoot yourself. On a side note, while playing Stealth Assassin, the same concept applies. Before initiating your attack by casting Smoke Screen on your opponent, backstab them once or twice before doing so. People can’t react instantaneously to your attack, so take advantage of this as much as you can. Let’s say you and 2 heroes are going to gank 2 opposing heroes in bottom lane. This is going to be a 3v2, so your team has the hero advantage. The optimal strategy here would be getting 2 of your team’s heroes to focus down one hero, while the last remaining hero (the one who can stall the most time, or who can keep the enemy within striking range) goes after the other one. For example, a Rhasta or Lion with/without cyclone, Vengeful Spirit, Pudge, Drow, or Bane Elemental would suit this role perfectly. After your 2 teammates get rid of the first hero, you have kept the second one there waiting for them to come for the kill. Basically, DO NOT go all out on one hero, because there is a good chance that the other one will escape. Creeps can very well decide the outcome of the battle. During early game, the damage output from 3 creeps is equivalent to another hero. Therefore, you want to try and fight those close battles with creep advantage, meaning that you have more creeps hitting the enemy than he has hitting you. It is best to get to the point where you have this sixth sense of knowing whether or not you are going to win the battle when trading hits with the enemy, with and without creep advantage. That way, you will not be missing out on any opportunities to kill the enemy. You also need to be careful when running/chasing into creeps. If you suddenly run into them when retreating, they may stall your movement enough for the enemy to catch up and land the finishing blow. If your opponent’s creeps block you when you are chasing them, you may very well lose out on the kill. A good way to manage this is to pay attention to the minimap, and see how far the creep spawns have travelled across the map in your lane. You can figure out when you are going to run into them, and avoid them completely. I briefly mentioned path blocking back in the optimal chasing tactics section of the guide. I stated how it could be used to make the most out of offensive siatuions. Keep in mind that path blocking can also be used for defensive purposes as well. If your ally is getting chased by an enemy and you cannot do anything to help them (whether your stun is on cooldown, you have no mana, you have no stun or slow, etc...), one option would be to run into the opponent’s path and block their hero from getting any closer to your ally. If done properly, this may prevent your ally from taking any additional hits, and it may prevent your opponents from getting in range for that finishing nuke. Of course, you have to be careful when attempting this technique. The opponents could very well just switch their target onto you instead. You need to be able to survive their combos, or else you will end up dying instead of your ally. If you have a natural escape mechanism like blink, invisibility (windwalk, lothars, bottled invis rune, permanent invisibility, etc...), you should not be afraid to do this. In order to use your hero to its full potential, you need to maximize all the benefits that your hero receives throughout the game. This includes things like creep kills, and gaining as much experience as possible to level up. Remember to try and stay in range of all creep kills and hero kills. It sounds easy in theory, but in practice, I seldom see players trying to get in range for the hero kill XP. Specifically, when players are getting chased and they are near-death, the only thing that’s on their mind is getting the hell out of there. When reinforcements arrive, they just keep on running away, even when it is apparent that the chaser is going to get killed by your allies. You are going to be missing out on a huge chunk of XP that is non-recoverable. I have also seen situations where Venomancers uses Poison Nova and Shadow Strike to kill an enemy hero, but not follow them to their deaths for the experience. Yes, following too far may lead to you getting ganked and all, but on the other hand, there are times where it is perfectly safe to do so. Take into account things like how far you are in enemy territory, how many heroes are missing on the minimap, and use your own judgment in the game. There are going to be times where you fight a battle when your experience bar is almost full. If you are fighting near anything that is going to die and give experience, you may level up. During early game, a level up gives you enough HP to tank one more hit. Whether you are going toe-to-toe with a hero, or chasing behind a tower for a kill, this ability to tank an extra hit has the potential to save your life. Try to factor this into your calculations when deciding which battles to fight, instead of relying on luck. There are also going to be times where you will level up in the middle of a battle. Keep in mind that you do not necessarily have to stick to your originally planned skill build. For example, if you are playing Rhasta and you have gone shackles/fork/fork/shackles up until level 4. After you use shackles and fork to kill one hero, another one comes up from behind. You have 150 mana left, and are very close to dying, Instead of sticking with your original build and learning forked lightning, take a level of voodoo and hex your opponent. That way, you will be maximizing your chances of survival. Proper spacing is an art. The ability to constantly position yourself in an advantageous way is a very valuable asset. Proper spacing allows you to minimize damage taken, while maximizing your potential to tank as much damage as possible. For example, staying out of the attack range of an enemy hero minimizes the damage you take. Timing your escape so you run out of their attack range 1 hit away from death is pushing the limits of your hero. If you have a haste rune, this becomes a lot easier to do. Spacing is best utilized in conjunction with the fog of war. As long as the enemy loses vision of you, you cannot be targeted, and you are safe for the time being. Make the most out of the situation, and don’t be afraid to re-engage the enemy. Ranged heroes have a natural advantage over melee heroes. They do not have to travel as far in order to be able to hit their targets. This advantage can be heavily abused when ranged heroes are running away from melee heroes. When you are playing the ranged hero, you are able to fully take advantage of spacing, and the fog of war. When the melee hero is chasing you, you can just run out of their vision and hit them at a safe distance since the melee hero has to target you again. When the melee hero gives up chasing, your superior range enables you to turn around and get in some free hits. If the ranged hero happens to have a slow, by golly, the melee hero won’t be able to do anything (assuming he is relying on physical attacks). Maintaining proper spacing in this situation is crucial to getting the most out of your hero, as you want to maximize your damage output, while minimizing damage taken. Throw in a haste rune into the mix and you will be pretty much untouchable. Heroes like Centaur, Pudge, Abbadon, and Bane Elemental can kill themselves with their own skills after their HP drops below a certain point. Many players will attempt to deny you gold and experience when it is apparent that they are going to die. When you are chasing these heroes, you need to keep in mind that they can kill themselves, instead of mindlessly watching your hero attack them. If you have finishing nuke or stun, save it for the finishing move after your attacks bring them down to a certain point. If you do you not have a finisher (or do not have the mana for it), then you must attack them to the point a bit before they attempt to suicide. For example, let’s say you are chasing a Pudge with a Faceless Void, and he is at 90 HP. You don’t have mana for chronosphere, but you have enough for timewalk. You decide to timewalk over to slow him down. If you hit him once, it is likely that Pudge will turn on rot and will suicide himself. What you should do in this situation is to fake an attack (press “S” in the middle of the attack animation), and try inducing your opponent to start using rot. If he does, then wait until his HP drops low enough for you to kill in 1 hit. If he doesn’t, then it’s likely that he isn’t even thinking about denying you the kill. Proceed to attack him if the latter is the case. Throughout this guide, I know I’ve said a lot of things along the lines of “this may be the deciding factor whether blah blah blah…”. It may not seem like that big of a deal, and in most cases, it usually won’t be. However, it doesn’t hurt to keep in mind all these tactics, and to always do them. That way, you will never have to look back on a situation and ask yourself “What if I did something different back there? Could I have actually survived that situation?” DotA is a very dynamic game that requires you to make many decisions in the spur of the moment. The amount of time you have to make your actions count is very limited, so make the most of it. If you see a player doing all these little things in the game, you can conclude that they are probably very experienced, and are decent players. Knowing how to utilize your hero to its full potential is the basic foundation for getting better at the game. A lot of other concepts like mindgames, risk taking, being a team player, and response hacking, develop a lot on these basic concepts. It also depends on your own ability, and courage, to push your hero to the limits. nice guide, specially the SHIFT key utilization for Skills. When i play pudge i am so afraid that my enemy will run away is that i never manage 3 second Dismember.After about 2 second i stop the channeling and start running with the enemy cuz i lack patience. Nice Guide... Thanks a lot this guide is so great i learned many things in playing dota... Good job!! !